WikiCU is a wiki with articles related to Columbia University and its neighborhood. It is effectively an insider's guide to Columbia University. As an observant Bwog commenter notes, WikiCU is to an extent Columbia's "institutional memory". For a list of similar wikis at other universities, see WikiNode. 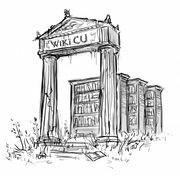 If you're just getting started at WikiCU, check out the Community Portal (there's also a persistent link on the left-hand-side page column). You may also want to check in at the Editors bulletin board to see any community-wide notes shared by WikiCU editors. The site was first conceived on April 12th, 2006. It was originally intended to be at "cuwiki.com". However, the domain was no longer available by February 2007, so "wikicu.com" was registered instead on February 28th, 2007. Other options included "cuwiki.net" and "cuwiki.org", but these were judged inferior to a ".com" domain name. Since then, "cuwiki.org" was registered and was the location of a wiki about Cornell University until approximately early 2013 (offline as of May 2013). The first edits by the wider Columbia community started to be made on Tuesday 6th March in the late afternoon / early evening. Meanwhile, for several years, Columbia's undergraduate student councils intended to create a Columbia wiki called "Project Athena". The students working on this project managed to create about 50 brief articles, but they didn't get round to making the site publicly accessible. A Spectator editorial on September 6, 2006 spoke positively of the prospect of a Columbia wiki, but noted that "if the delays run too long, students may take it upon themselves to create their own solution. As has been shown by the abundance of private Wi-Fi networks, when the institution doesn't provide a means, students will just come up with their own ways to communicate-and procrastinate." Well, as it turned out, the Spectator's prediction came true. When WikiCU emerged, the articles written for Project Athena were moved to corresponding articles in WikiCU. WikiCU's first wave of editors included members of the classes of 2006, 2007, and 2008. A tremendous amount of initial energy was expended on creating pages with information directly relevant to student life, including detailed information on undergraduate dormitories, the Administration, guides to neighborhood resources (such as banks and ATMs in Morningside Heights, and cataloging student traditions, new, and old. While many of the early editors remained active after graduation, their focus necessarily shifted to adding historical material as they moved farther away from student life. As a result, information on student life pages (e.g. information on room selection and housing strategies) fell out of date. This shift in editing focus is probably what has led to the misconception that "the site has not been seriously updated since 2007, when the founders graduated." Shortly after WikiCU's establishment, its founder, who was going to graduate in May 2008, opened up discussions on whether or not (and to whom) control over WikiCU should be handed over to. Discussions would continue for years, including a proposal to hand the keys over to Spectator in 2010. The issue would in fact remain open until 2012. Despite the continuing uncertainty of its future, a cadre of WikiCU's editors continued to devote hours of their time, channeling their incredible powers of procrastination into growing WikiCU's historical materials. Over the years, as original editors faded away into real life, they were replaced by new active members. Overall though, the active user base remained small, and the issue of out-of-date student life articles persisted. In March 2012 WikiCU was compromised by malware, and the administrators were unable to save it. After some discussion Sam Aarons SEAS'14, webmaster of Bwog and creator of Print@CU, took over. The following year, student leaders began taking an active interest in revitalizing the wiki. Student government participants created How-to guides, and in spring 2013, Bwog/The Blue and White and CCSC spearheaded the 2013 Columbia Wikithon to add new material and refresh older article. There are indications that wikiCU is becoming less of an 'underground' source, and more accepted in the 'mainstream'. Columbia's General Counsel submitted a printout of a wikicu page as part of a filing with the United States Patent and Trademark Office in 2009. Columbia College Today directed readers to look-up information on Orgo Night and Primal Scream on WikiCU in its July 2010 issue. The Music Library created a page on Columbia University Songs and referenced and linked to WikiCU. Going forward Sam Aarons is transitioning control to Bwog. WikiCU is powered by MediaWiki software, which records several statistics. As of this moment, the wiki has 4,041 useful articles, or 11,096 if you count all the shorter articles, redirect pages, talk pages, and so on. The wiki also has 1,981 images and other uploaded files. So far, 1,418 users have registered, and 15 have additional administrative powers including the ability to fly. Federal law protects WikiCU from libel lawsuits. Section 230 of the Communications Decency Act, passed in 1996, specifically states that "no provider or user of an interactive computer service shall be treated as the publisher or speaker." Thus, unlike print and broadcast companies, online service providers cannot be sued if their users disseminate defamatory materials. ↑  Select 'Documents' and then the 'Specimen' dated February 18, 2009. This page was last modified on 2 November 2013, at 08:57.